This project is a realignment of the existing “tee” or 3-leg intersection of Lakeview Boulevard as it meets Jean Road in the Rosewood neighborhood of southwest Lake Oswego. Currently, Lakeview enters Jean at a 45-degree angle. The project will realign Lakeview with a horizontal curve that will join Jean Road at a typical 90-degree angle. 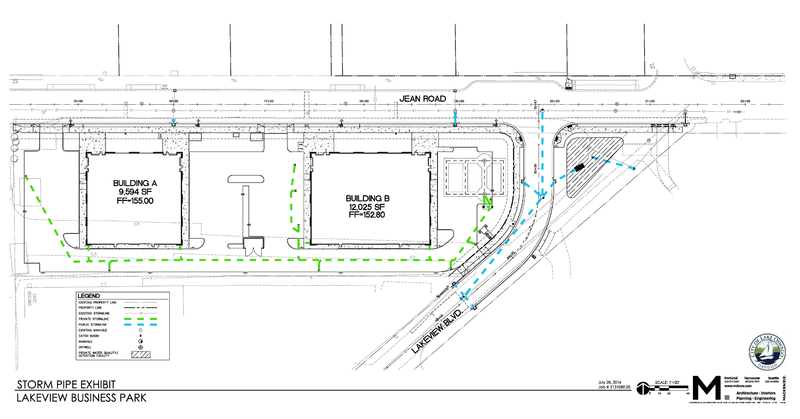 Perpendicular (90-degree) intersections are preferable and this project will improve the turning movements of all vehicles approaching Jean Road or turning from Lakeview Boulevard. Elimination of the skew will improve roadway and pedestrian safety, reduce turning space needed for freight vehicles, and provide better sight lines to estimate approaching traffic. Along with roadway improvements, the roadside treatments will include sidewalks, landscape plantings, and new stormwater collection and treatment. The environmental benefits include treatment of the collected stormwater, which helps our groundwater, streams, and rivers receive clean water; the added landscape plantings have been chosen to, not only beautify the intersection, but to clean the stormwater, improve air quality, and provide screening of residential properties. This work is expected to take about four months to complete. Construction is expected to begin in mid-late April 2019. Approved by City Council on June 7, 2016, the Southwest Employment Area (SWEA) Plan identified this intersection realignment project, as well as full improvements to Lakeview Boulevard/65th Avenue/McEwan Road. These roads will eventually contain the same cross section to manage the industrial traffic and extend the stormwater infrastructure. This project will realign the Lakeview Boulevard approach to Jean Road. Presently, Lakeview intersects Jean at a 45-degree angle, creating difficulty for drivers maneuvering turns at the 3-leg intersection. The realignment will bring Lakeview to a 90-degree angle with Jean Road. The public improvements will include curb and gutter on both sides, a sidewalk on the north/west side of Lakeview Boulevard, accessible pedestrian ramps at the intersection and driveway reconstruction. A stormwater pond will also be constructed in the remnant Lakeview right-of-way to treat the roadway runoff. Construction is expected to begin the week of April 22, with single lane closures and flagged traffic in the work area, both on Jean Road and Lakeview Boulevard. Lane closures on Jean Road will be between 9 a.m. - 3 p.m. Monday to Friday. Throughout May, Lakeview Boulevard is expected to be closed 24/7 between Jean Road and Belmore Avenue and a detour will be in place. This closure is expected to be in place for about a month. At most times, access will be maintained for residents and businesses in the closed zone. Jean Road is expected to remain open, however single lane closures may be in place. Construction is now expected to begin in mid-late April and take up to four months to complete. City approved work hours are Monday to Friday 7 a.m. – 6 p.m., and Saturdays 8 a.m. – 6 p.m.
During the first few weeks of construction, businesses and neighbors should expect single lane closures and flagged traffic on Lakeview Boulevard, between Belmore Avenue and Jean Road, and on Jean Road, between Pilkington Road and Jean Way. Starting in May, Lakeview Boulevard is expected to be closed 24/7 between Jean Road and Belmore Avenue and a detour will be in place. This closure is expected to be in place for about a month. Click here to view the detour map. Jean Road is expected to remain open, however single lane closures may be in place. Please share this information with your employees, tenants and delivery drivers. Please note, construction schedules are subject to change.